In an effort to make room for more parking spaces and reduce congested streets around town, The San Pedro Town Council (SPTC) is enforcing its sandwich boards regulation. Already in effect, the implementation will see the immediate removal of such boards that impede the free flow of pedestrians and are becoming an issue for drivers. The SPTC is kindly asking business owners to cooperate with the norm and to begin removing their sandwich boards before they are picked up by SPTC personnel. Mayor Daniel Guerrero stated that the rule has faced difficulties in the past when it comes to enforcement. But in view that it is becoming a problem in certain areas of town, the regulation will be fully enforced. 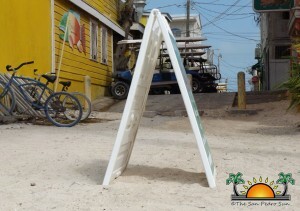 “No sandwich boards will be allowed on the beach. We expect business owners to abide by this rule and remove the boards.” Guerrero indicated that the only areas where these boards can be used are at docks or other areas that do not interfere with the free flow of persons. “There are areas where it is difficult to walk or to park due to these boards, we want this to stop,” he said. According to Guerrero, the decision to implement the rule comes from the many complaints by residents, and even visitors. He understands that many businesses, like restaurants, use them to display their services to attract potential customers. But according to him, it has become necessary to monitor where these are placed, so it does not become an inconvenience for the general public. The Mayor invites concerned business owners to visit the offices of the SPTC for more information during normal working hours. The SPTC offices are located on Barrier Reef Drive and opens from 8AM to 5PM, Monday to Friday.